©1922 Elizabeth von Arnim (P)2014 Audible, Inc. I liked Lotte's positive character. However it's not the location that created the 'love' everywhere it's the fact that people were away from their own home life distractions and were able to actually focus on their own loved ones without distraction. Lotte was the driving force in assisting people to alter their perceptions in a positive more loving direction. Frederick is a dishonest man and doesn't deserve Rose. I didn't like that Rose had been fooled by him. It seems that she will have to relinquish her beliefs about his books in order for them to remain together. 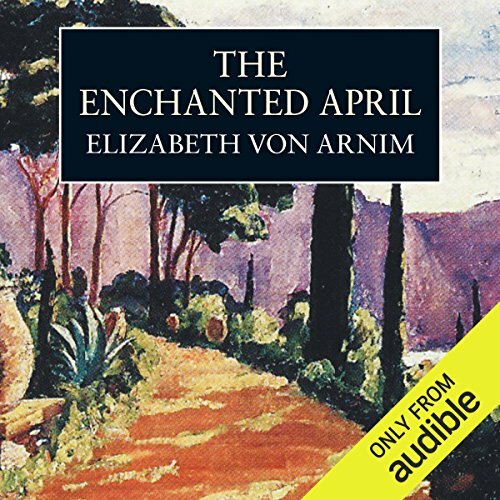 Where does The Enchanted April rank among all the audiobooks you’ve listened to so far? What was one of the most memorable moments of The Enchanted April? What about Eleanor Bron’s performance did you like? If you could rename The Enchanted April, what would you call it? Oh, Gosh! What a Delightful Surprise! Would you listen to The Enchanted April again? Why? I purchased this audiobook because it came cheap. I had low expectations. So imagine my surprise when I found fleshed-out characters, a not so easy journey for them, and twists in the plot. Even though I absolutely knew how it'd turn out in the end, it was so good (and so well narrated) I zipped through, chapter after chapter. And I look forward to doing that again someday because really: what a delight! All the characters have complicated natures, complicated desires, and unexpected challenges to growth. Mrs. Wilkins, Lottie, however, is a natural favorite as she's the catalyst for change, the one who leaves her subservient self behind, and looks to the future with hope while enjoying every second of the present. This book really makes you look at the beauty around you, and it inspires you to fling off your shackles with joy. I particularly was impressed by how many little obstacles were thrown in the way of the characters. What should have been a predictable journey to growth was instead written with challenges for them. This had me biting my nails now and again. I found nothing wrong with Eleanor Bron's performance but was instead really quite taken with it. There are different versions of this book, but I suggest this version as Bron has a knack for delivering the different tones of the characters' natures, their emotions. She doesn't make the annoying mistake of trying to warp her voice into different characters but uses subtle variations to distinguish them. She really captures their longings, their fears, their hopes. Make no mistake, this is light reading/listening. If you're looking for deep plot dynamics, save this for later. But by all means, come back later if you'd like some refreshment. It's a little gem that I had no idea was out there. If you've longed for an Italian holiday in a quiet old villa with charming friends, this is your ticket. It will be even better if you adore flowers and good, if short, conversations. A likening for the British will positively seal the deal. Can't get away right now? Read The Enchanted April. Enchanted April is one of my favorite books. I have read it yearly and thought Eleanor Bron read it the way it is supposed to be read. Four women of various ages decide to share the rent of an Italian villa for the month of April. Two of the women are bored and dissatisfied with their marriages, one is a selfish elderly widow, and the fourth is a snobbish, young, single aristocrat. I loved the setting of this book. I want to book a month’s vacation there. Although, I would definitely choose different companions. The book was first published in 1922; so the mannerisms, concerns and personalities of these women were a bit dated. I just could not warm up to any of them. I was expecting more feminine bonding in the course of the story and was very disappointed with the arrival of the husbands. The easy resolutions in marital relations were too simplistic for the seriously troubled relationships. At the end, I just wanted to shoo all of the annoying people out of the villa, so I could go sit on the terrace and enjoy the beautiful view in peace ! I previewed several audio versions of this book before settling on Eleanor Bron. She gave a solid performance with a good variety of voices for the different characters. Best Narrated version out there. Best Narrated version out there. I could listen to this over and over. I imagine she read it just as the author intended. Loved the book even more than the movie! I choose titles as much for their narrators as I do for the authors, and Eleanor Bron had the perfect tone and ease of manner for relating this much loved story. This is one of the few books I will be listening to more than once. And, as much as I loved the movie, which I've probably seen three times now, the book added more details, more richness, and more comprehension, as was to be expected. Most of all, I loved hearing the descriptions of love and happiness and awakenings in that lovely Italian garden written by someone with a keen eye for beauty and grace, in the words spoken of another with an equal appreciation. It was a marvelous listening experience! The characters, the setting, the conversations and the reactions what a wonderful book!! I loved it. I have two different narratives of this book. One runs over nine hours and this version is just over eight. The British accent makes an enormous difference and the female voice is critical. If you buy this book buy this version. I throughly enjoyed this book by audible. The story uplifting and the commentary by the characters witty. It makes me want to go to Italy in April. The 'Love' I am referring to is another lesser known book by Elizabeth von Arnim and which is to my mind a far more interesting story. The Enchanted April is a pleasant enough book and it does have some biting wit, but on the whole it is all rather safe and lovely, like a cosy but slightly stifling Sunday afternoon BBC drama. This follows the story of 4 gentile but rather different ladies taking a holiday in Italy together. As is predictable, their rather frosty exteriors begin to melt in the glorious Italian sunshine and the causes of their various miseries are magically resolved. I must admit I found the deference paid to the Lady Caroline character extremely irritating and made the whole thing seem very bourgeois and dated, but then I suppose that's what this book is, and I shouldn't be too surprised. Once again Eleanor Bron does an excellent job but without any really dramatic scenes I don't think she really had to try too hard with this one. This is a real feel-good story. Eleanor Bron is an excellent reader who brings out the full humour of the dialogue, as well as doing full justice to the descriptions of Italy. Hearing it read aloud, as opposed to reading it from the page, totally enhances this classic book, and I would thoroughly recommend it to anyone who wants a mental escape to a perfect destination. What did you like most about The Enchanted April? What does Eleanor Bron bring to the story that you wouldn’t experience if you had only read the book? She made the characters come alive - such a fabulous voice - so well-read. Well written, beautifully read. Charming escape. Most interesting content: characters of different women of the time and insights into their lives. Beauty of Italy; different sorts of marriages. Eleanor Bron reads superbly. She is one of my go to narrators. Well worth a listen if you like character and relationship based fiction that doesn't move too fast. A very well written, totally plausible tale of self discovery and love. Beautifully interpreted by E.Bron...and then there is Italy in her splendor and glorious scents! A delightful read, describing times we have perhaps forgotten, when women were not free to make their own choices. Written nearly 100 years ago, this book will delight, appall and enrage you until the magic of Italy pulls you in and enchants you. I cannot say I disliked this book but it was a bit dull, not much going on except for the last half an hour of listening. The narrator does not add enough "spice" to the story. The description of the landscapes and the characters of the book is very poetic and pleasant, though. Just listen to it. Made perfect by Eleanor Bron’s voice and story telling. Loved it.